Travellers Caught in a Sudden breeze at Ejiri. Katsushika Hokusai. ca. 1832. Woodcut. Study for ‘A Sudden Gust of Wind (After Hokusai)‘. Jeff Wall. 1993. 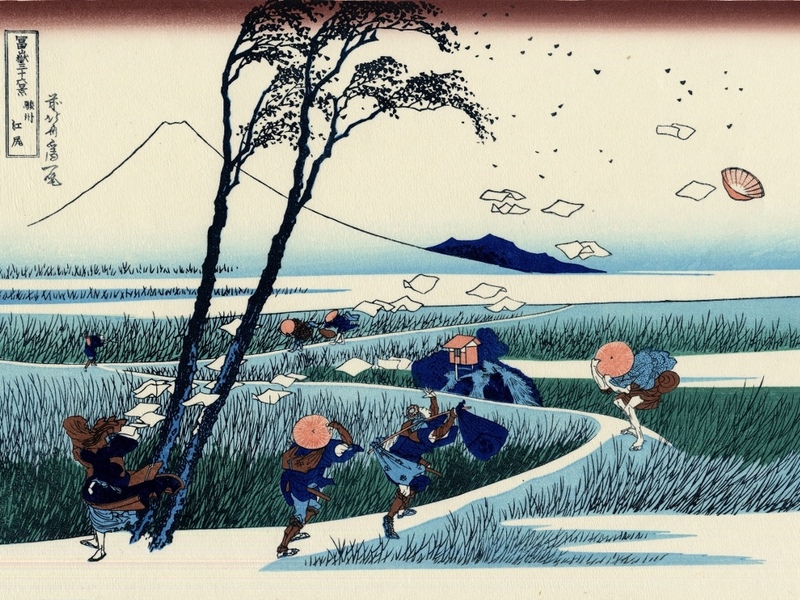 A Sudden Gust of Wind (after Hokusai). Jeff Wall. 1993. Transparency on Light Box. 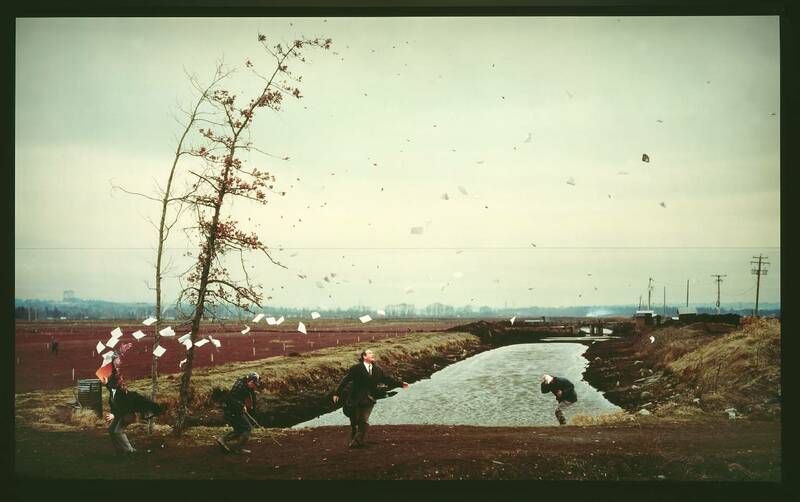 A Sudden Gust of Wind (after Hokusai) by Jeff Wall is a large colour photograph displayed in a light box. 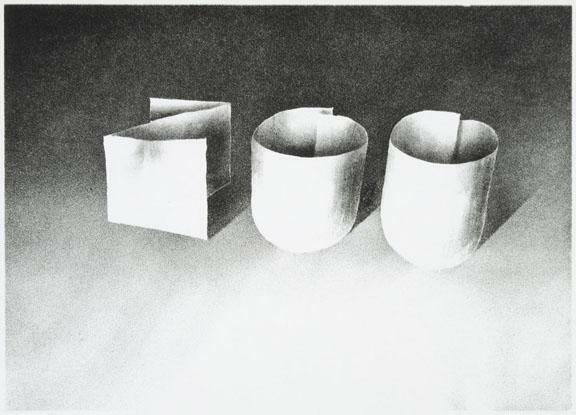 It depicts a flat, open landscape in which four foreground figures are frozen as they respond to a sudden gust of wind. It is based on a woodcut, Travellers Caught in a Sudden breeze at Ejiri(c.1832) from a famous portfolio, The Thirty-six Views of Fuji, by the Japanese painter and printmaker Katsushika Hokusai (1760-1849). Wall photographed actors in a landscape located outside his home town, Vancouver, at times when similar weather conditions prevailed over a period of five months. 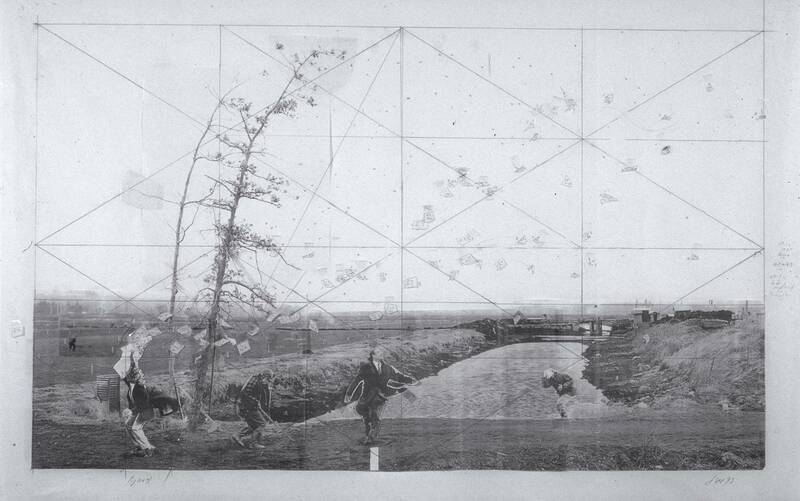 He then collaged elements of the photograph digitally in order to achieve the desired composition. The result is a tableau which appears staged in the manner of a classical painting. As in Hokusai’s original, two men clutch their hats to their heads while a third stares up into the sky, where his trilby is being carried away by the wind. On the left, a woman’s body is halted in a state of shock, her head concealed by her scarf which has been blown around her face. A sheaf of papers in her hand has been dispersed by the gust and their trajectory, over the centre of the image, creates a sense of dynamic movement. Two narrow trees, also in the foreground, bend in the force of the wind, releasing dead leaves which mingle with the floating papers. In Hokusai’s image the landscape is a curving path through a reed-filled area next to a lake, leading towards Mount Fuji in the far distance. In Wall’s version, flat brown fields abut onto a canal. Small shacks, a row of telegraph poles and concrete pillars and piping evoke industrial farming. The unromantic nature of the landscape is reinforced by a small structure made of corrugated iron in the foreground. The pathway on which the figures stand is a dirt track extending along the front of the photograph from one side to the other. There is no sense of connection between the characters, whose position in the landscape appears incongruous. Two wear smart city clothes, adding to the sense of displacement.